Lucca is a city in Tuscany with a rich artistic and architectural heritage that still follows the town layout much as it was in the Roman era and with the historic centre surrounded by defensive walls built in the 16th century. 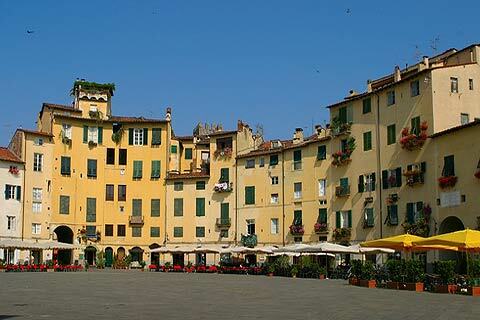 Because the city centre in Lucca is quite compact and follows a simple grid layout exploring is quite straightforward. 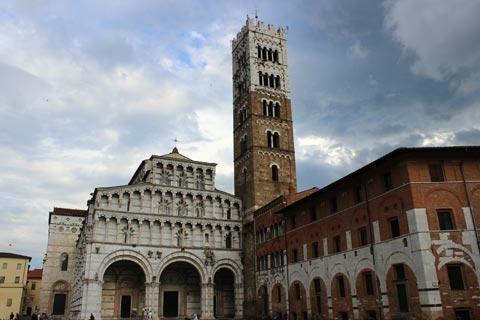 There are a great deal of places of interest to discover in Lucca and it is a very pleasant city with numerous ancient streets, open squares and imposing buildings, shops and parks to explore, so we suggest you allow at least a day for your visit. 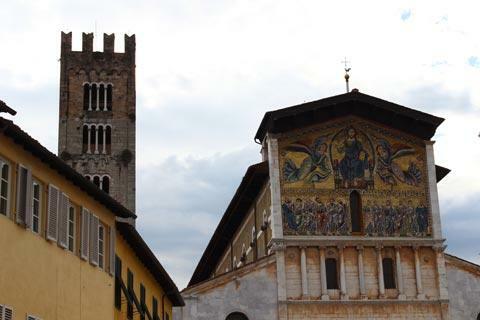 Italy This Way comment: Lucca is one of our favourite historic towns in Italy so we recommend you spend 2-3 days staying here, exploring and visiting some of the monuments and restaurants and taking in the atmosphere, rather than making a flying visit! 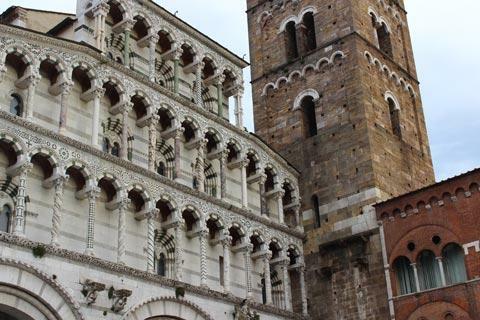 Although it is the character of the city as a whole that is the main attraction, there are also important historic monuments here such as the cathedral, the basilica and the Church of San Michele. 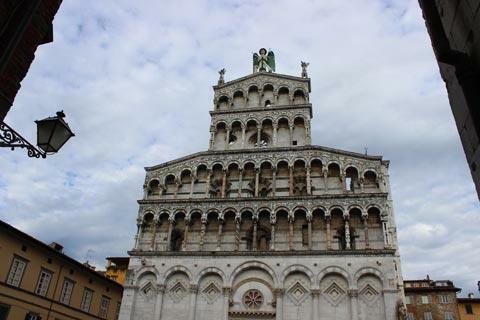 One of the most important religious buildings in Lucca, the Cathedral of San Martino is located in one of the main squares in the town, Piazza San Martino. The cathedral was founded by San Frediano in the 6th century, then rebuilt by Anselmo da Baggio, bishop of the city, in 1060 and finally rebuilt again between the 12th and 13th century. In the cathedral porch, which is part of the very lovely ornate facade of the cathedral, there are three large arches: Guidetto and his collaborators created the bas-reliefs that depict the martyrdom of Saint Regulus in the lunette above the entrance to the right aisle, another series representing the months, and the stories of San Martino in the entrance to the left aisle with the "Deposition" by Nicola Pisano [1220-1284]. Inside Lucca cathedral you can see the tomb of Ilaria del Carretto [1379-1405] by sculptor Iacopo della Quercia [1374-1438] and the Temple of Matteo Civitali [1436-1502], which houses the Holy Face of Lucca, a 12th century carved wooden crucifix. 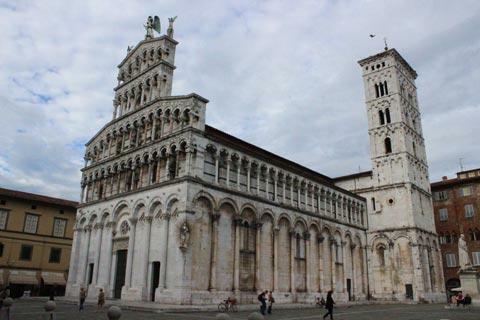 Also worthy of particular interest in Lucca is the Basilica of San Frediano, one of the oldest churches in the city and located in the square of the same name. The origins of the church seem to date from the 6th century when there was a church here dedicated to the three holy Levites Vincent, Stephen and Lawrence. Excavations carried out beneath the present church confirm the presence of the old building. Although substantially restored the appearance of the medieval cathedral is clearly visible, with the aisles divided by columns imported from Rome. The baptismal font in the church is among the most important examples of Romanesque sculpture in Lucca while the chapel of the Trenta Family was built and decorated by Iacopo della Quercia, who created the altarpiece with the Madonna and Child with Saints Lawrence, Jerome and Frediano in the early decades of the 15th century. The fresco of the Martyrdom of Saint Vincent, Stephen and Lawrence is one of the oldest examples of medieval painting in Lucca and dates from the first half of the 12th century. Between the 15th and 16th century the Chapel of the Cross was decorated with evangelical themes, scenes from the life of Saint Augustine and subjects of local sacred history by Amico Aspertini [1474-1552]. The sculptor Matteo Civitali also carved statues of the Saints Frediano, Augustine and John I and is the painter of 'Our Lady of the Annunciation'. It was his nephew Masseo that created the large wooden altarpiece depicting the Madonna of the Assumption. The altars and their decorations were renewed between the 16th and 17th century . 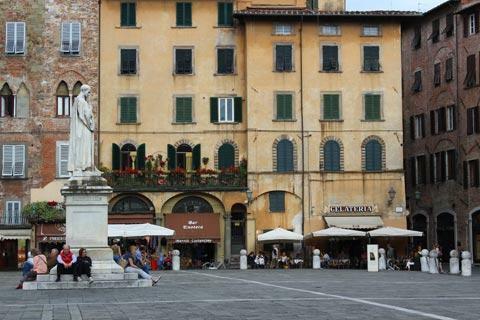 This is a very impressive square - called the Piazza Anfiteatro and with lots of medieval houses and lots of cafes. 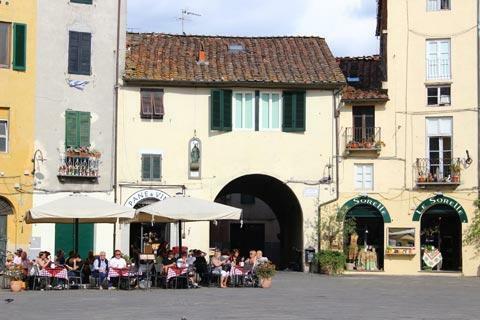 It is our favourite place in Lucca to stop for a beer! Another important monument in Lucca is the Torre Guinigi, the most important tower in the historic city and one of the few remaining. This mighty tower, made from stone and brick, is 45 meters high and stands out above the surrounding buildings. Its main feature is the presence of a huge oak on the top of the tower, reached via 25 flights of stairs and a total of 225 steps. The views across the city from up here are exceptional. 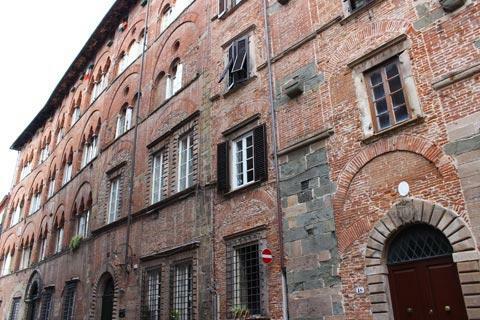 Also dating from the 15th century is the adjacent Palace of the Guinigi, an example of late Gothic style architecture. In the Piazza San Michele, which is dominated by the Basilica of Saint Michael, the Roman forum was once found. The Basilica, which was documented for the first time in 795, is an impressive combination of styles with both romanesque and gothic elements and with a very attractive roman style facade. 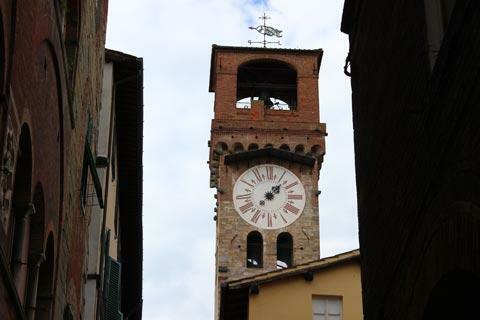 The bell tower dates from the 13th and 14th centuries, while the effigy of the Archangel Michael located in the center is attributed to Guidetto da Como (13th century) and is three metres high. 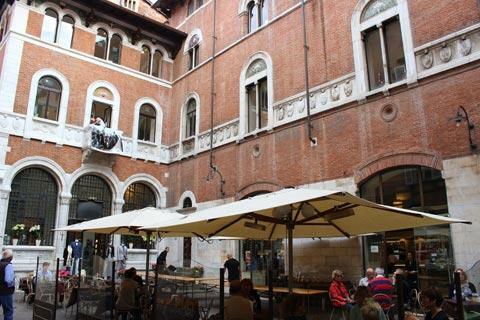 This piazza is also very impressive with numerous medieval buildings. Inside the church is divided into three aisles by columns with Romanesque capitals. Of particular note among the artworks is the 'Martyrdom of St. Andrea ' by local painter Pietro Paolini (1603-1681); the Madonna and Child, glazed terracotta by Andrea della Robbia [1435-1525] and the panel depicting the Four Saints by Filippino Lippi [1457-1504]. Another highlight in Lucca centre is the 17th century Palazzo Pfanner, in particular the chance to see the lovely gardens, laid out to a formal design in the 18th century. 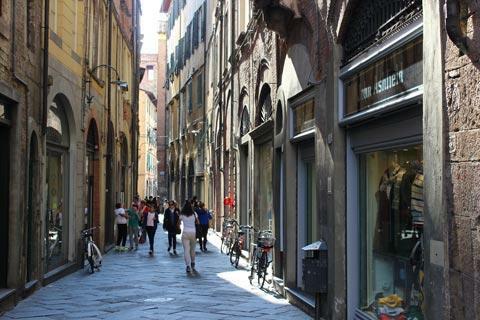 This is also a good place to enjoy some shopping, the principal shopping street in Lucca and also very attractive even if you don't like shopping, is Via Fillungo that passes north to south through the medieval town in the north of the city centre between Piazza San Michele and the Piazza Anfiteatro. As you walk along this street you will discover lots of side streets and diversions as you continue to explore the rest of the centre or find somewhere for lunch in one of the many restaurants. 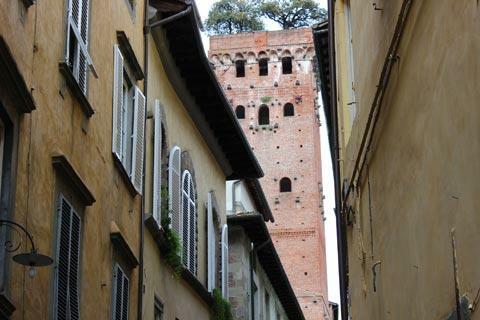 A relaxing change from the centre of Lucca is to follow the ramparts walk around the town, which also has lovely views and provides a different perspective on the city. In all the ramparts walk covers several kilometres and overlooks the gardens that have been preserved around the centre: originally this area was left undeveloped so the city could see enemies approaching. 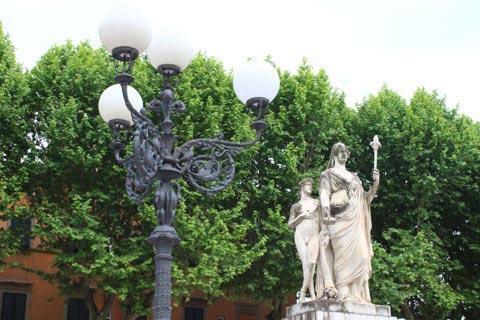 Note: this rampart walk is a popular place for a promenade and for jogging and one of the liveliest parts of the town! The Art Gallery of Lucca, in Palazzo Mansi, houses works from the Renaissance to the 18th century and stands out in particular for the Concert hall, painted by Giovan Gioseffo del Sole [1654-1719], while in the Groom Room there are some Flemish tapestries depicting the story of Queen Zenobia [240-270 AD], and the Emperor Aurelian [215-275 AD]. Among the painters of the Tuscan school exhibited note in particular the works by Pontormo (1494-1557) with the "Portrait of Alessandro de Medici" and Tintoretto (1519-1594) with "Portrait of a Man". There are also works by Domenichino [1591-1641] and some Flemish painters. Also worthy of a mention is the section devoted to silk weaving in ancient Lucca. 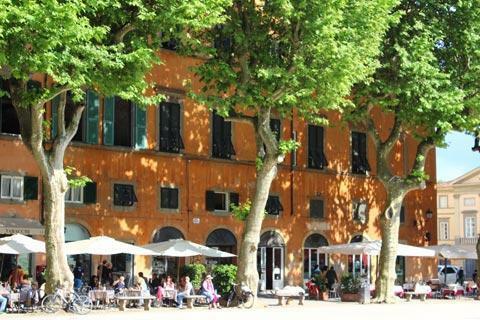 The cuisine in Lucca boasts is strongly linked to the town's ancient country traditions. The typical products of Lucca also have the advantage of belonging to a very diverse natural environment, ranging from the sea to the valleys, passing through mountains and hills. North of the city there is a particularly picturesque region, with chestnut and olive trees, hills, dotted with villages and ancient castles, which Sismondo Sismondi baptized with the name of "Switzerland of Tuscany". 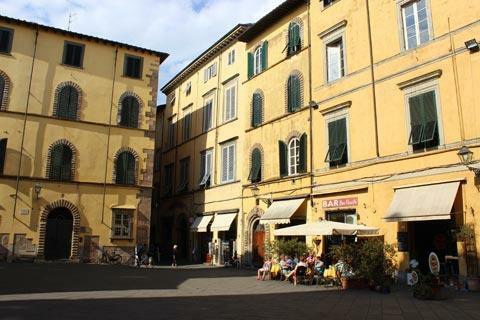 Lucca is situated in a broad and fertile plain on the left side of the river Serchio in north-western Tuscany. It is a short distance north-east of Pisa and to the east of Florence.